Editor’s note: This Q&A features high-performing seniors from Fort Dodge Senior High and St. Edmond High School throughout the school year. 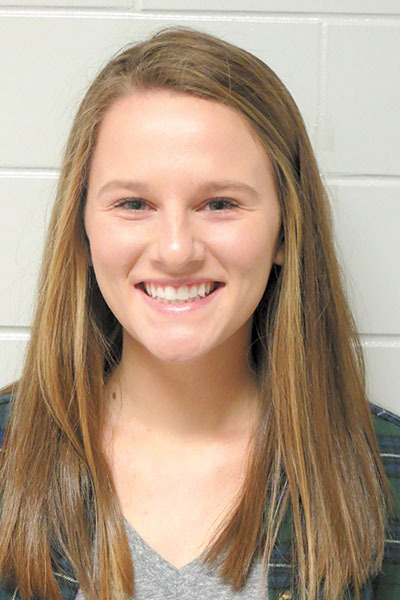 This week features Brooke Erickson, of Fort Dodge Senior High. 1. What programs and activities do you participate in? 2. What academic accomplishment are you most proud of? Receiving the academic award for my GPA throughout the years. 3. What’s your best piece of advice for younger students? Don’t wish to be a senior; it comes faster than you think. Enjoy where you’re at and it’ll come soon enough. Also, care about your grades. They’re important. 4. What is your go-to song or artist? 5. What is your favorite class or subject and why? My favorite class is Iowa Central human anatomy and physiology with Mr. Long. I love the course content, and the way he teaches makes it even better. 7. If you could have dinner with someone famous, who would it be? Ellen DeGeneres. She’s hilarious and cracks me up. 8. What are you working hardest on right now? 9. Who is your role model in life? My mom, she’s the strongest person I’ve ever met. 10. What is your favorite memory from your time in Fort Dodge schools? It’s tough to choose. My favorite memories all came from sports. I’d say when Baxton drove the van up to the dorm doors and honked until everyone woke up at volleyball camp was pretty memorable. Of course, laughing and bonding with my teams is something I won’t forget.